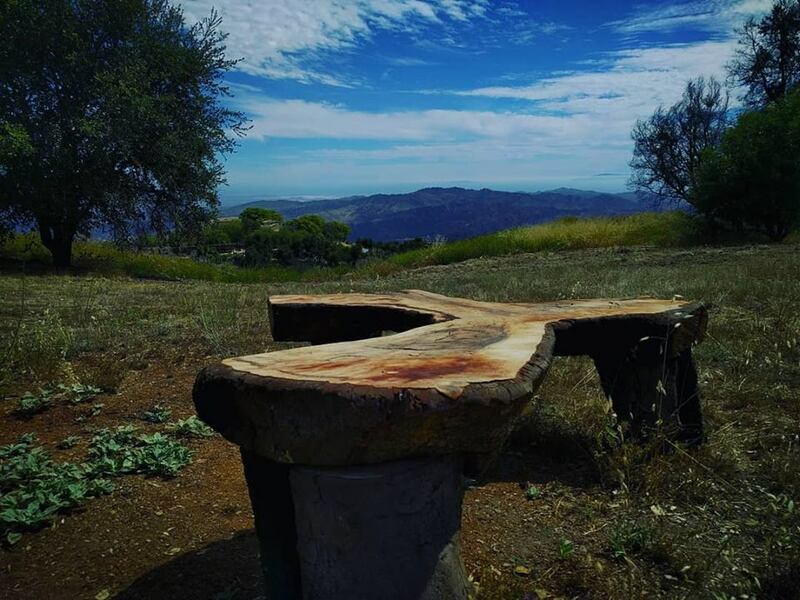 The following is a reprint of an article from the Ojai Valley News about the status of Baba's Tree more than a year following the December 2017 Thomas Fire. The article was published on February 22, 2019. The tree, originally estimated to be 200 feet in circumference and 75 feet in diameter, previously burned in the New Life Fire in October 1985. More than a year after the Thomas Fire, the badly burned tree is showing an abundance of green sprouts, especially over the center of the broken trunk. Ervin said there’s been some die-back on a couple of limbs that did have sprouts, but the majority are still growing. “Those are looking very healthy,” he said. Though fans of Baba’s Tree are increasingly upbeat about prospects for its survival, Ervin was not quite ready to say it will pull through. “Our arborist, Michael Inaba, thinks we should wait through another summer to see how it responds to the heat before we declare that it’s going to survive,” he said. Measures taken to save the tree began with the installation of 600 feet of new irrigation pipe and diffusers, “so that we could water it carefully and under instructions from the arborist,” Ervin said. The tree’s caretakers brought in 24 cubic yards of mulch that was applied up to 6 inches deep under the entire, previous canopy. They also had the arborist put in adjustable steel props under the four largest, heaviest limbs, “which pose a danger both to the tree, if they had fallen and shattered, and also to individuals who might be working or walking under there,” Ervin explained. Workers also installed a security fence around the tree to protect the ground, so the mulch can do its job without soil compaction caused by foot traffic. They also protected the 300- to 500-year-old tree from the rays of the sun. “Live oak limbs are very susceptible to sunburn once there’s no canopy, so we wrapped the exposed limbs and a good part of the trunk as well in fabric that protects the limbs,” Ervin said. In addition, the arborist sprayed a clay mixture on the leaves of the new sprouts, which protects them from the sun. While more than 40 volunteers came forward to tackle various tasks over the past year or so, others pitched in with monetary donations to pay for materials. Caretakers also harvested wood from the fallen parts of the tree. They hired custom furniture artisan Harold Greene to fashion benches from some of the bigger pieces and harvested thousands of board feet of lumber that were turned into planks. Meanwhile, new sprouts have emerged from the charred trunk and branches. “Some of them are 7 feet long and tangled, so we’re going to do something to give them some structure, to help rebuild the canopy,” Ervin said. The new growth, along with recent rains, have been encouraging, he added. Will the recovery of Baba’s Tree take years, perhaps decades? The next stage will be developing long-term plans for making the tree more accessible to visitors, while still protecting it. Perry Van Houten, "Saving Baba’s Tree: Burned branches sheltered mystic," Ojai Valley News, Friday, February 22, 2019. (c) Ojai Valley News, Downhome Publishing, LLC.